The Italian 90mm calibre 90/53 gun was primarily an anti-aircraft weapon but was also used in other roles. It was a good and reliable weapon but never produced in sufficient quantities to satisfy demand. In this configuration it saw service in Italy and, after Italy’s surrender, in the RSI and even in defence of the Reich itself once the Germans took over production. 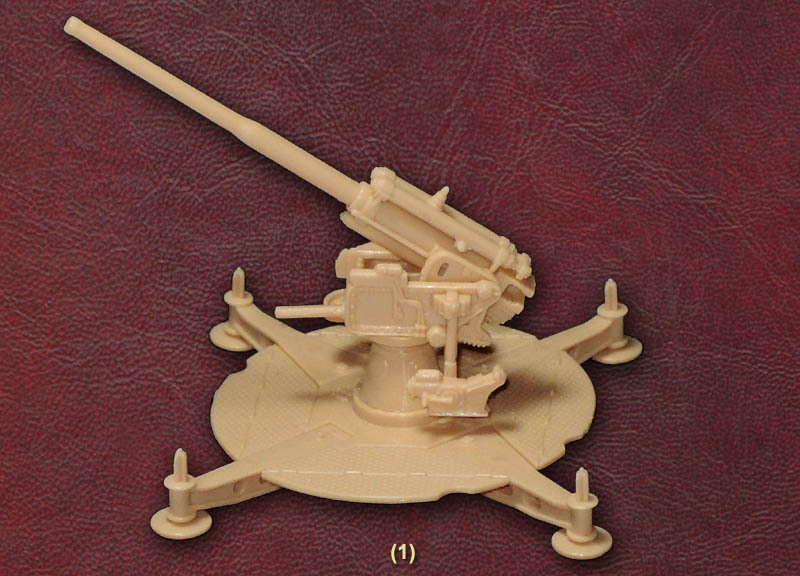 The version of the gun modelled in this set is with the cruciform platform which had folding wheels to allow towing. Strangely however these wheels are missing here. The gun is assembled from a small number of parts and makes quite an appealing model. We found it remarkably difficult to find good photographs or illustrations of this gun, and as regular visitors will know 20th century guns and tanks are not our strong point, so it is hard to comment on the accuracy of this gun in any detail but in general it looks fine. The model is nicely produced and fits together well without any need for gluing. The gun rotates through 360 degrees and elevates too, just like the real thing. Although inevitably simplified to a degree the detail is good, so this is a really well done model. The gun was usually crewed by eight plus an officer, so the eight figures in this box are slightly below a full complement. They include some fairly common artillery poses including several handling shells, and two of the crew are for sitting on the seats of the gun’s controls, which explains the raised arms on these poses. This means that they give a good impression of actually interacting with the gun - an all too rare feature in artillery crewmen in this hobby. In total then all the poses are good and useful. On the whole these men are wearing regulation uniform, with tunic, pantaloons and leather gaiters, and the steel helmet on the head. Most wear the leather bandolier across the chest, which was common in artillery and mounted units. Also all the figures wear a tie neatly tied at the neck. While this was part of the regulation uniform such smartness could hardly be expected of troops in the field and photographs confirm a more relaxed attitude to dress, so these men are rather too smart for actual battle. They are however lightly kitted, with most having no more than a water bottle and their personal weapon slung on their backs. As with the gun the general level of sculpting on the figures is very good, with good detail and proportions everywhere. The rifle on the back of the third figure in the top row is especially low slung, presumably for the convenience of the sculptor as this is both unnatural and would impede movement. We should also mention that these figures are a bit over tall given the subject, but they are entirely free of flash or other annoying blemishes. To be honest the sprue which contains all these parts rather rattles around in the box, which does not give the impression of giving much for your money. At the very least Italeri could have built up the contents with some spare ammunition, shell cases and range-finding equipment. The combination of small misgivings we have mentioned about this set add up to a product that is good but not great, although still usable and a welcome boost for the relatively few products for Italy’s army during the Second World War. Substitute a German artillery crew and you also have a weapon used by them to defend their homeland in the last months of the war. It should be noted that the above eight figures are also provided in Italeri's model of this gun mounted on a lorry (kit reference 7508).